When launching cost-saving or quality improvement efforts, healthcare payors and providers often fail to consider one major factor: the resistance they are almost certain to encounter from their medical staffs. Intent upon patient responsibilities, many physicians are neither cost-focused nor open to administrative changes. In this special report, "Bringing Doctors On Board: Cultivating Physician Leaders and Reducing Pushback," a panel of experts describes a variety of tools including skills assessment, communications, incentives and marketing that can turn physician "push-back" into support, ensuring the success of new programs while developing physician leadership at their organizations. You'll hear from Mary Anne Graf, Vice President, Women's & Children's Services, Bon Secours Health System; Dr. Manuel Lowenhaupt, National Practice Leader, CapGemini; and Dr. Mark Wenneker, Consulting Manager, The Bard Group on theories, application and results of physician engagement programs. 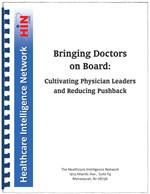 This 36-page report is based on the January 26, 2005 audio conference "Physician Engagement: Tools and Strategies to Get Reluctant Physicians on Board" during which Graf, Lowenhaupt and Wenneker described how to engage physicians, including strategies and case studies. Creating physician alignment through marketing.